Happy New Year! I hope your winter break was fabulous, my children returned back to school today and as much as I've enjoyed having them home - I'm ready to get back to what we call "normal". It always seems like it takes a few days to get back into our normal routine after a long break. This morning we were ready though, alarm clocks set, school clothes set out the night before and I even had their lunch boxes packed and ready to go! Speaking of back to school, I love packing my children's lunches for them! I always make sure to include their favorites as well as good nutrition and better for you selections! Whether it's a Saputo® Frigo® CheeseHeads® Cheese Snack or a Del Monte® Fruit & Veggie Fusions, I know there won't be any leftovers returning home at the end of the school day! As a mom, it's so important that I'm able to send my children to school with a healthy lunch! I want them to have the nutrients they need to be able to focus on their school work, the energy they need to play with their friends at recess and full belly's that make their little bodies happy for the entire school day! 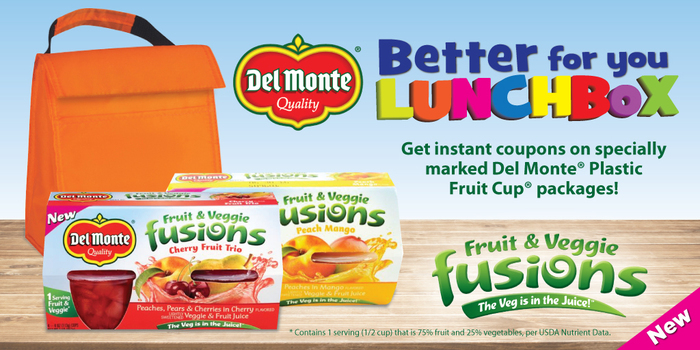 When you visit your local Walmart this January and February, keep an eye out for Del Monte® Fruit Cup® Snacks! Del Monte will be hosting a themed “Better for You Lunchbox” booklet on 1 million packages of it’s Fruit Cups. You'll find $6.25 in instant coupon savings from great lunchbox brands including: Del Monte®, Pepperidge Farm®, Welch’s®, Diamond Foods, NatureSmart, Saputo®,and Musco® Olives.